These are the words of Jesus at the Last Supper which instituted the Eucharist. 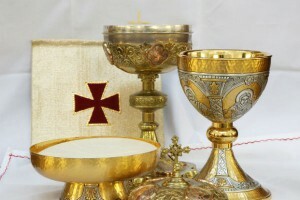 When we receive Holy Communion we become united more deeply with the living Body of Christ which is His Church. It renews the graces we received at Baptism and Confirmation, strengthening us in our life’s journey. In the Archdiocese of Birmingham, First Holy Communion and Reconciliation are usually received at primary school age, with instruction often taking place in the Catholic school. In the case of adults or children outside the Catholic education scheme, a period of instruction will take place in another setting. For adults this may take the form of a Right of Christian Initiation for Adults (RCIA) course and reception into the Church, with Confirmation and Holy Communion taking place at Easter.